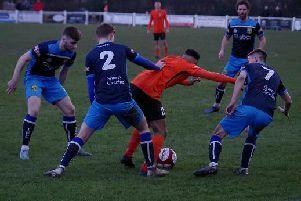 Josh Barrett struck four minutes from time to ensure Tadcaster Albion returned from their long trip to Colwyn Bay with a point. The Brewers fell behind inside 20 minutes in North Wales but defender Barrett got forward from the back to guide Josh Greening’s 86th-minute free-kick into the back of the home net, earning his side a share of the spoils. Manager Michael Morton made just the one change from the FA Trophy defeat to Glossop as Cameron Murray replaced Conor Sellars in the starting XI. On a sunny yet blustery afternoon, the hosts began the contest on top, causing Albion problems from set-pieces. Fittingly, the Seagulls then broke the deadlock inside 20 minutes from a corner kick when Louis Barnes pulled off to the back post and headed the ball into the path of Sam Barnes who, after several bites at the cherry, eventually scrambled into the back of the net. The Brewers then squandered a glorious chance to equalise two minutes later. Tom Corner’s half-volley was saved by Matt Cooper but only pushed into the path of Aiden Savory who side-footed onto the post. Just 60 seconds after this chance went begging, Pete Davidson broke out of midfield and surged at the Bay back-line before sliding in Murray, but his heavy touch took the ball straight into the keeper’s hands. Greg Hartley has proved a safe pair of hands between the sticks since taking his place in the Tadcaster team and he demonstrated this again just after the half-hour-mark. Jack Hindle played a neat one-two with Danny Andrews before volleying ferociously on target, but Hartley caught the strike confidently. Albion almost drew level on the stroke of half-time follwing a scramble from a corner, but Andy Milne was unable to stretch far enough to divert the ball goalwards. The Brewers came out for the second period with greater hunger and urgency about their game. Milne was close to getting on the end of a set-piece once again, but this time a Laurence Hunter free-kick was well defended. At this point there was only one team looking like scoring as Taddy went close once more. Murray’s cross set-up a 50/50 between Bay goalkeeper Cooper and Albion striker Tom Corner. Both players went in for the ball and Corner ricocheted it beyond the stopper, only to see the ball spin off the line and onto a post. The only real controversial moment of the afternoon arrived half-way through the second period when Bay’s Luke Horrocks raised his hands and struck Savory on the head, only for a yellow card to be issued. Hartley had little to do, other than a couple of routine saves until he was forced into action by Danny Andrews’ low, fizzing effort. But just as time looked to be running out, Taddy got themselves a deserved goal. With chances few and far between, it was another set-piece that got Albion back on terms as centre-half Barrett stuck out a leg and guided Greening’s free-kick past Cooper and over the line. Next up for Albion is a home clash with struggling Skelmersdale United at the i2i Stadium on Saturday, 3pm kick-off. The Lancashire outfit sit third-from-bottom of Evo-Stik Division One North having won just twice in 12 games.